Before falling in love with raw food, I went through a vegetarian phase, which lasted for several years. My kitchen shelves are still stocked with lots of inspiring cookbooks from that time. One of my favourites was New Vegetarian Food by Christine McFadden. It had a number of smart, tasty recipes that I kept coming back to, and this tart is a tribute to one of them. 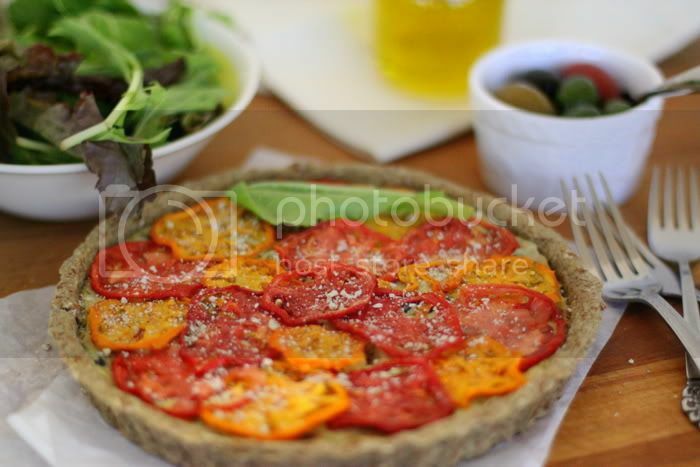 A sun dried tomato, basil and olive tart. Let me just say that the recipes for both the original and raw variety of this tart are very close to my heart. The former reminds me of the time when I just became interested in whole foods. It brings me back to those first few exciting years in the kitchen, when I discovered that nourishing food is also versatile and delicious. The latter is a source of personal culinary achievement. I love it when a recipe that I’ve been daydreaming about comes together just the way I imagined. This raw tart tastes almost exactly like the original, or maybe even a bit better. Of course, the original recipe calls for ricotta and parmesan cheeses, eggs and butter. After some brainstorming and careful estimations, I came up with this little tribute, and we loved it on the first try. It’s wonderfully creamy, with a subtly spiced crust, and bits of basil, sun-dried tomatoes and black Cerignola olives spread all throughout. Luckily, it’s the season of fragrant, local & organic tomatoes here in Florida – just in time to garnish and bring some sweetness to the plate. I made several tarts of different sizes, as I usually do with any kinds of tarts, pies, or quiches. There were individual, baby ones for Paloma and for bringing to lunch at work, and bigger ones for the whole family. I also discovered that the tart holds very well in the refrigerator for several days, unlike many other raw dishes. In fact, it becomes even better after it sits and all the flavours become integrated. Paloma and her papa like to eat dinner on the beach, after their evening walk. My husband has mentioned that this dish tastes even better outside. At home, though, as I witnessed, Paloma was crazy mostly about the crust. I watched her carefully bite around the whole diameter to get the crunchy bits. She’s a funny one. Mix all the crust ingredients in a food processor until smooth, adding more water if needed. Press the dough into your tart shells, preferably with removable bottoms. Distribute the dough evenly against the sides and bottom of the shell. Place the tart shell(s) in the dehydrator for 4-5 hours. Gently remove the shell from the mold, and put it back onto a screen-lined dehydrator tray. Dehydrate for another 8-10 hours until completely dry and crispy. fresh red and yellow tomatoes for garnishing – optionalIn a high speed blender, combine the coconut meat, water and oil with the Irish moss until very smooth. In a food processor, mix together the nuts, lemon juice, yeast, salt and water until well combined and fluffy like ricotta cheese. Add the basil leaves and pulse briefly. In a large mixing bowl, gently fold the coconut mixture into the nut “ricotta”, followed by the chopped sun-dried tomatoes and olives. Pour the filling into the crusts. Dehydrate at 115F for 6 hours, then refrigerate overnight. Optionally, slice fresh tomatoes thinly and dehydrate on Teflex-lined dehydrator trays just to dry the surface. 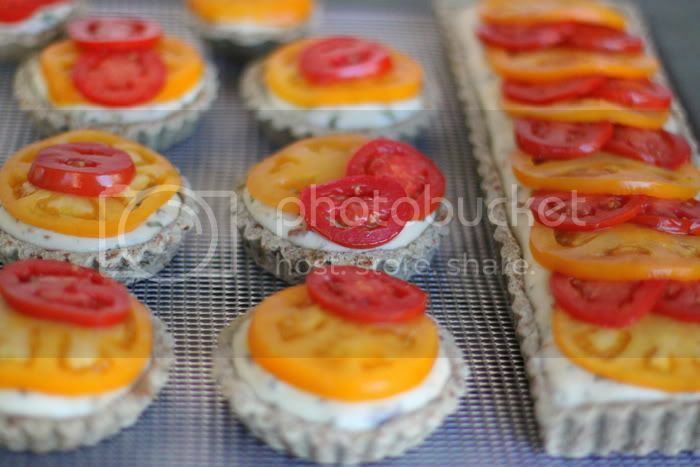 Garnish the tarts, placing the tomatoes dry side down for the last 1-2 hours of tart dehydration. Winter won’t stop here in France… I’m so longing for the season of tomatoes! I’ll have to wait but I think I’ll test the crust recipe sooner, because I try to eat more and more raw food. By the way thank you for your tips, I ordered Living Raw Food and can’t wait to receive it! I’m a mother of two and you inspire me so much to feed my children healthy, nourishing foods! I love how passionate and dedicated you are to feeding your family all things healthy and delish. Thanks! Can you make me some and just ship them :) They look and sound delicious!! Oh my goodness, I cannot wait to try this! It looks so delicious! 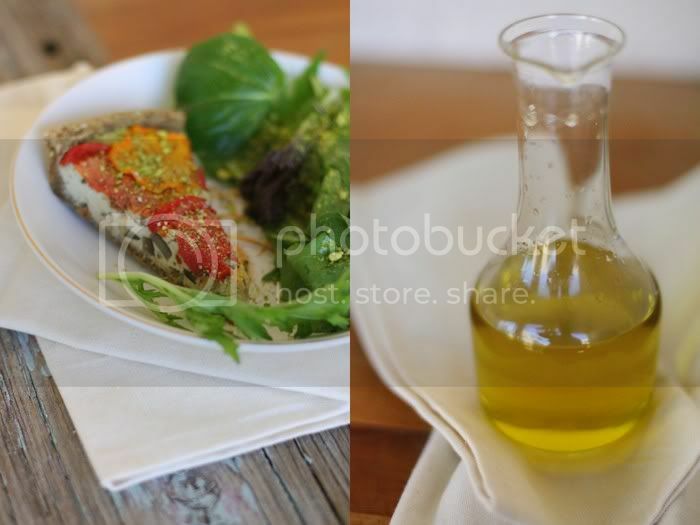 As always,I enjoy your plating and photography! When’s your non- cook cookbook coming out? :)Wishing you much success! I’m so going to make this as soon as our tomatoes are in season! Or maybe I’ll figure out something else to fill into that crust, it sounds so delicious. Я тебя нашла случайно ( читая комментарии в одном из американских блогов ). Комплименты, очень красивый блог и особенно рецепты! wow. 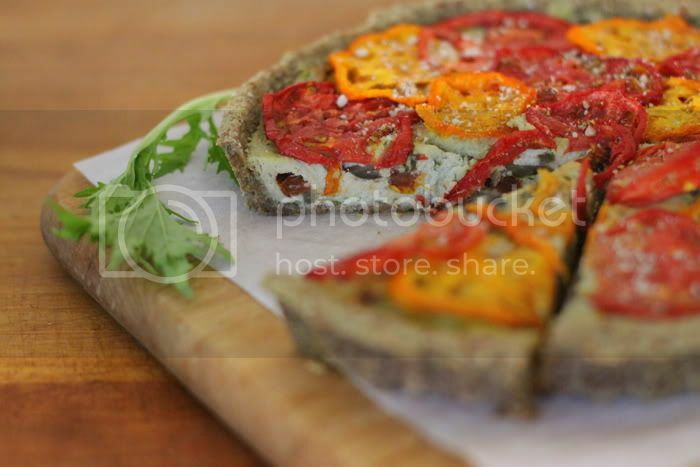 this blog just makes me wanna go and buy a dehydrator. this recipe looks amazingggg. by the way, do you eat only raw food? You absolutely don’t need me to say this, but these pictures are gorgeous, and the tart looks delicious. I’ve only just discovered your blog, but am really looking forward to reading some of your old recipes. I have to confess I don’t know anything about raw foods but if this recipe is anything to go by it looks wonderful! Wow, this looks absolutely delicious and so healthy to. I’d love to try it but not sure I’d be able to get my hands on Irish Moss here. I think I will follow along here because your pics are so beautiful and the dishes are calling me. I don’t know too much about raw foods but would definitely be interested. I just made a ravioli with butternut squash that was a hit in my house. That is STUNNING! Beautiful photography! Looks so beautiful! Love the vibrant colors. Thanks so much for the comments everyone! Hope you enjoy the recipe. Mom x2, so wonderful to hear that! Thank you. Teri, thank you! A cookbook…for now we only dream! Jacqui, fresh tomatoes are optional in this recipe. They only go on top of the tart as a garnish. For the base of the tart, use canned/preserved sun dried tomatoes. Anni, thank you! We are not all raw, we enjoy traveling, trying new foods and learning about different cuisines. At home, though, we like to eat raw. Wow, this looks so delicious! Definitely enough to convert anyone to raw food. Really Stunning, makes you wish summer were here too! Thanks for sharing. Love the recepie. What dehydrator do you use and where can I get one? 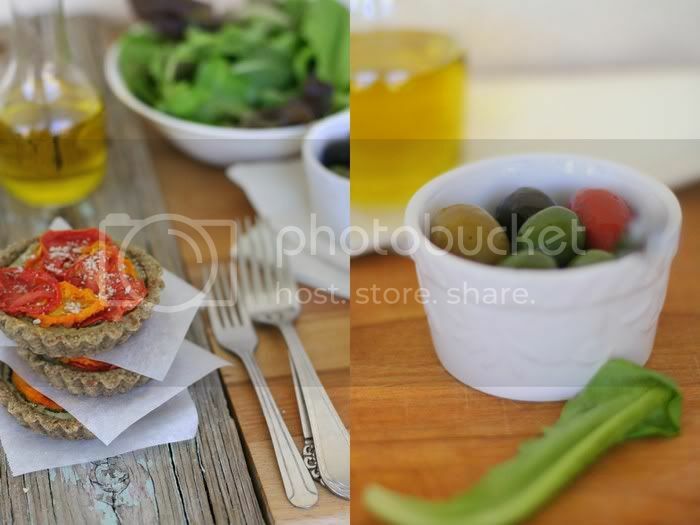 Amazing how you make dishes that are as creatively beautiful as they are healthy. How lucky your family is to have someone so talented, and dedicated. Amazing photos! This looks like a feast for the eyes and the palate. I can’t wait to try! Gosh those are beautiful! Stunning. Thank you for generously sharing your recipe. We are definitely going to try this! YOU ARE SUCH A RAW TALANT!! 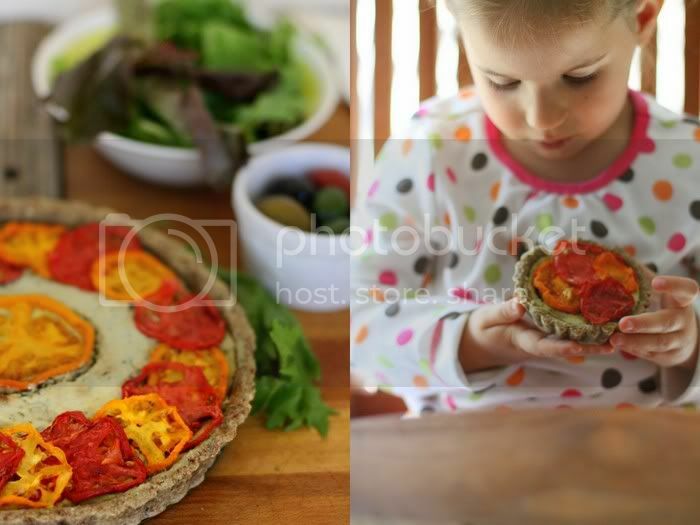 I am so impressed that you made a raw, vegan tart. Wow. This is just SO lovely!! This looks amazing. Just found your blog. Look forward to following. I always have problem with the young coconut, as it is a non-existing product in Hungary. Do you have any suggestion what I could substitute it with? And of course I don’t really want to use more nuts instead. I cant wait to grow fresh tomatoes once we move down to Alabama (in just a couple of weeks!) I will bookmark this recipe for sure! Thank you! Anna’s Page, we use a 9 tray refurbished Excalibur dehydrator, which we got on ebay. Electricbluebaking, thanks for letting us know, we’ll check it out! Norka, I get this question a lot and, unfortunately, I do not have any good answers. Young coconut is such a unique ingredient that is very hard to replace. The only replacement that comes close are blended nuts, but I know that is not what you are looking for. It’s really too bad that young coconuts are not available in Hungary! I have to say that even here in the States I really have to hunt them down, and they are not cheap! I love your photographs! So colorful and yummy-looking. You are so talented! Every post I read always amazes me, and it’s incredible that you manage to keep it raw. I am a big fan of tarts, and will go back to this recipe next time I bake one. And I realize that we soon need to get that dehydrator. The big question is where we will store it? Our kitchen is already cramped with stuff. Bonjour, j’aimerais beaucoup essayer cette recette mais je voudrais savoir par quoi je pourrais bien remplacer la chair de coconut thaï, car il n’y a pas de cet ingrédient dans ma région. Merci pour les suggestions…. Your images are so inspiring. I can’t wait to try this! Summer is come back! That’s good. This tart is my ticket to leave the winter. I *HAVE* to try these! As always you are inspiring and your photos are fantastic. I’m going to change the flavors and textures a bit, as the coconut is a challenge for me as well. I’m thinking zucchini with a touch of onion, and maybe sweet potato. Tarts and quiches are my favourite foods to cook and experiment with. Your raw version is a new inspiration and I really love the colours and arrangement. THANK YOU! What an astoundingly beautiful tart! One question, however – would additional irish moss work in lieu of coconut meat?